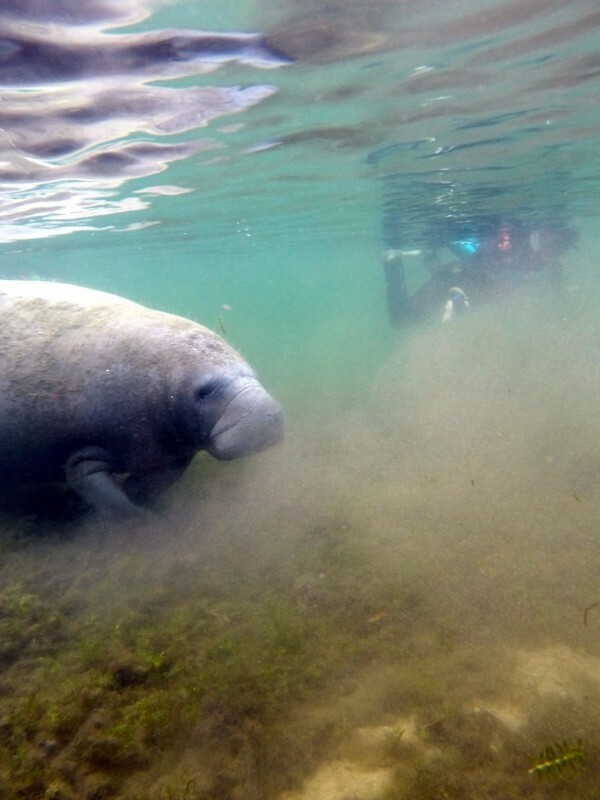 Recently I planned a trip to Florida for some wreck diving and I decided to drive 6½ hours from the Keys up to Kings Bay, Crystal River to swim with Manatees. I wondered: did I book myself a tourist-attraction or would it be a great snorkeling experience? This blog is to paint a picture of the Kings Bay Manatee experience so that you can decide if this is something for you. As a diver I have many bucket lists, including diving with whale sharks, manta ray and sharks. Sea Cows (which include Manatees and Dugongs) are also on this list. Manatees are a protected, endangered species and when you’ll encounter one you’ll understand why: they are completely harmless and tame. 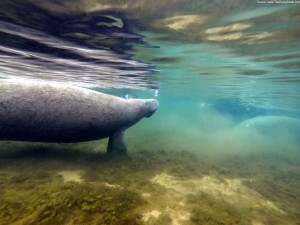 Crystal River is home to the largest concentration of West Indian Manatees in the world. More than 1,000 manatees visit Citrus County each year during the winter season and this population is still growing. The season generally runs from November 15th to March 31st when the Gulf of Mexico has cooled down, forcing the Manatees to come inland to stay close to the warm springs (22°C/72°F year round). Citrus County is the only place in the United States where you can swim with the manatees. Note that scuba diving with Manatees isn’t allowed (you might try in the non-protected areas, but in the protected areas you’ll pay a hefty fine and there are many voluntary rangers to watch you). 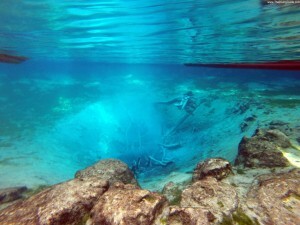 In particular Three Sisters Springs is famous for its clear water and hundreds of manatees that gather here in winter time. This also brings in hordes of people, from kayakers to swimmers and other day-trippers, all eager to see, photograph and swim with these friendly creatures. When there are too many manatees this spring is closed by the Fish & Wildlife authorities, which is assessed on a daily basis. In such event there are also numerous Manatees to watch in other parts of the area. What is the best time to snorkel with Manatees? The high season usually runs from November 15th to March 31st which is when the Manatees are coming inland to the springs. The start/end date depends on the temperature of the Gulf. There are always some ‘residents’ so that you are likely to see off-season. It’s rare to see none, but it has happened, so operators don’t guarantee anything during the summer. So what does the Manatee trip look like? My trip was at the end of October, so just before the season. The weather was still warm so it was a bit of a risk: most of the Manatees were still out there in the Gulf of Mexico. The good part was that there were only 2 or 3 boats scouting the area, each carrying around 8-10 tourists. The term ‘tourist’ is a better description than snorkeler since I quickly found out this has nothing to do with snorkeling! There were no divers on board and some people hadn’t snorkeled ever before. Most operators provide a mask, snorkel and wetsuit but no fins to minimize the chance of stirring up the loose soil and sediment on the bottom of the shallow rivers. When doing so, visibility is gone instantaneously. The water is so shallow (1-3 meters/3-10ft) that you can stand most of the times, so you’ll be given a ‘noodle’ to stay afloat. You’ll be cruising the shallow rivers on a flat type of boat until a manatee is spotted and the group silently goes into the water to swim closely to the Manatee to observe it. The captains help the other boats, so you’ll quickly surround yourself with a (couple of) dozen other ‘floaters’. This also works in your advantage since it boosts your chances to swim with the Manatee(s). It was OK. The fact that I did swim with a couple of Manatees was special. They are interesting and it is amazing to swim close to them to observe their behavior. The experience around it was not what I expected at all and I have mixed feelings about the experience. I’ll explain why. We arrived early morning (6 am) at the dive shop (Birds Underwater) where we picked up our gear. We were instructed (basically 20 versions of how not to disturb or touch the manatees) before we headed out before dawn. Despite the various timeslots you should consider the first boat ride out when the Manatees are most active. Later in the day they’ll be mainly interested in looking for food. Manatees are curious animals and they occasionally check you out (sometimes even sucking your face). Having said that, most of them will just ignore you. First thing that struck me was that you’ll be cruising a residential area. The villas along the canals and small bays with their gardens facing the waters and their private marinas are where the manatees are (that is, until they’ll head out for the springs, but also these are close to the residential areas). After cruising for about 10 minutes in these ‘suburbs’ we found 2 adult manatees and a calf/baby. Silently everyone went into the water and we were swimming with them in a half circle (you’re not allowed to surround them). The manatees were nice to watch. They aren’t bothered by your presence and were sometimes even bumping into someone on their endless expedition of grazing the bottom. We saw several more and I swam almost privately with a big one (3m/10ft) who was maneuvering between the boats and boardwalks. After some time people got cold so we moved on to Three Sisters Spring to take a swim. There weren’t any Manatees yet but it was an interesting pool to see with its amazingly crystal clear water (hence the name) and its springs. There were more fish than I’d expected. It also has a resident turtle and a tiny alligator, but the latter is hard to spot. In the afternoon kids often come here to play, so again, you might want to consider the early shift. Before noon we were back at the dive shop. After the trip (and still today) I have mixed feelings on the experience. It was truly nice to see the manatees up close and personal but it wasn’t any diving or snorkeling experience at all, mainly due to the number of people (and it was still off season) and the residential surroundings. It felt a bit like a zoo. So, if you would ask me if I would ever do it again I would think very hard and finally answer: Yes. But only with my kids.